The pope said something about evolution, and the media freaked out. Find out what he said—and what the Joker thinks about it. What did he say? Check out this short video of Pope Francis for details. You will actually hear him talk! Anyone who knows anything about Catholic history knows that a statement like this is nothing new. Pope Pius XII wrote an encyclical “Humani Generis” in 1950 affirming that there was no conflict between evolution and Catholic faith. Pope John Paul II reaffirmed that, stressing that evolution was more than a hypothesis, in 1996. Pope Benedict XVI hosted a conference on the nuances of creation and evolution in 2006. In addition to Dias’s piece, Tyler Francke also had a nice take on this “news” story. Francke runs God of Evolution, a blog you should be reading. For the best analysis, though, check out the Joker’s thoughts. After the commotion over Pope Francis’s words, Pew Research Center weighed in. 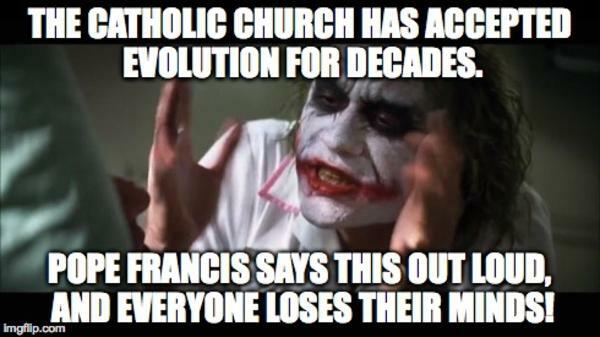 They reiterated what Dias, Francke, and the Joker said about the Roman Catholic Church and evolution. 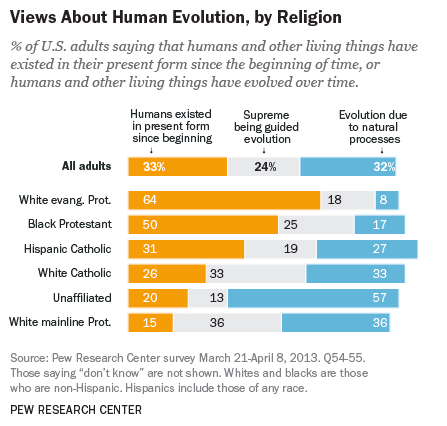 Pew included the poll below, which looks at overall acceptance of evolution in the United States. 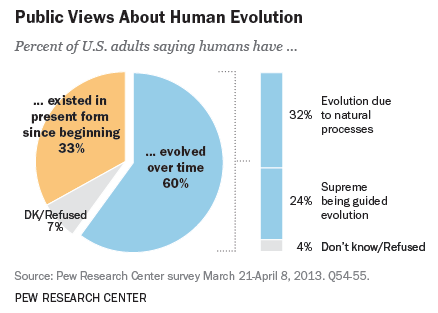 Pew also featured another fascinating poll. This one, below, shows that White evangelical Protestants are more skeptical of evolution than any other major religious group. Do any of these poll results surprise you? Keller’s book is called Prayer: Experiencing Awe and Intimacy with God. Jonathan Merritt just interviewed him about it. Metaxas’s book came out last week, and so did a hilarious trailer for it. This is easily the funniest book trailer I’ve ever seen. Is that a high bar? No. But this short video is still worth your time. What do you think of the buzz? That book sounds great – will have to check it out! For sure. Tim Keller’s the man. Great post Mike. I’ve always wondered how people who believe in evolution by natural process with no creator or supreme being guiding it explain the existence of anything at all to begin with that would start the natural process. Even if they break it down to the smallest and most basic particles that the universe developed from, those first elemental particles had to come from somewhere, right? We’re obviously talking about matters of faith and belief since we don’t have definitive evidence to point to who is right and who is wrong – I was just wondering if there was any rebuttal to the “first mover” argument. I also find it interesting that athiests or naturalists seem to feel more certain that their view is correct because they believe it is “rooted in science” – when in reality the science doesn’t actually prove that a higher power doesn’t exist. It is almost as though naturalists feel more comfortable with the sense of certainty they feel by subscribing to the view that they believe it is proven by science – almost like it is uncomfortable for them to accept that there are things we cannot and will not know. Not being able to arrive at a certain conclusion about our human existence is uncomfortable and can inspire fear – but I believe hope is born from the fear and uncertainty, and hope lies at the center of faith and belief in a higher power. If naturalists believe that their view is certain and proven by science, they don’t have to cope with the uncertainty by subscribing to hope and faith. Someone had mentioned in a comment on a prior post that they would be interested in learning the conversion rates of people surviving NDE’s from atheism to spirituality and vice versa. I look to a case like Storm’s – his experience stripped him of the certainty he understood his entire life as an athiest and now he is connected to faith and spirituality. PJ, I love this comment! I have two thoughts for you. 1) Regarding the philosophical stuff, I think you should watch two relevant lectures from Conor Cunningham and David Bentley Hart. They make a lot of great points about the limits of science and the difficulty of making sense of existence—if there is no God. 2) Regarding hope, I think Bane’s right. “There can be no true despair without hope.” JK. But seriously. Thanks for the Arnold reference and the Perry Marshall link, Eddie! I think you’ll Craig Keener’s work. Check out this short video that summarizes his big book on the subject.